The Mandalay Bay security guard who vanished after canceling five interviews with major television networks last Thursday reappeared in an 8-minute pre-filmed segment with comedian Ellen Degeneres due to air at 3 p.m. on Wednesday, Oct. 18, and confirmed that it was his last public appearance. DeGeneres guided security guard Jesus Campos through the details of the official narrative. He alleged that he was shot through the doors of Stephen Paddock’s 32nd-floor hotel suite at Mandalay Bay after responding to a door alarm. Campos told DeGeneres that when he was sent to check on a door alarm on the 32nd floor, he came up a stairwell from the 31st floor, but the door he was supposed to check would not open so he went back down and ascended via a different staircase. When he reached the door from the other side, he noticed that it was held shut with brackets and reported what he saw to security, which dispatched an engineer. Campos said that as he was walking away from the door, he heard what sounded like drilling. Officers who stormed the shooter’s hotel room said that they saw tools and drill bits inside. Campos continued to say that the drilling noise was later followed by rapid automatic gunfire. He ducked, saw that he was wounded and reported shots fired to security. 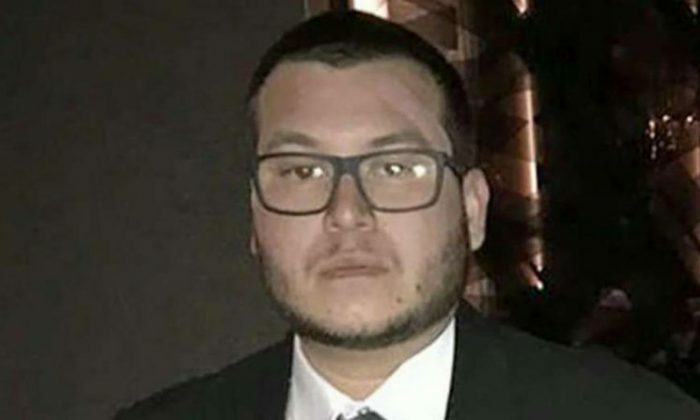 Campos noted that he did not report that he was wounded on the radio and used his cellphone instead in order to clear the radio traffic for security to coordinate a response. Campos also said that as he took cover, he saw a female leaving a room and told her to get back in because it was not safe. Later, a building engineer who was dispatched entered the hallway and walked toward the bracketed door Campos described. As the engineer came near Campos, the guard told him to take cover just before another round of shots was fired. The studio interview with DeGeneres appears to have been filmed with no audience. DeGeneres made no fanfare ahead of the appearance, despite the fact that major networks were lined up to hear from Campos before he abruptly canceled his interviews last week. Campos was joined in the interview by hotel building engineer Stephen Schuck, who claims that Campos saved his life by telling him to take cover. Schuck recalled his side of the story, saying that he came to the hallway from an upper floor and didn’t know what was happening until he saw Campos. Schuck told Newsweek on Oct. 12 that he used his radio to inform security about shots fired, but he did not mention this fact in the interview with DeGeneres. Campos has been at the center of several official narrative changes as police and the FBI continue to attempt and piece together what happened before high-stake gambler Paddock carried out the deadliest mass shooting in modern in U.S. history. Campos was initially hailed a hero for interrupting Paddock several minutes after the shooter began to fire on the crowd across the street. But the authorities changed this narrative several times, raising questions about the efficiency of the response by hotel security and police. DeGeneres has slot machines branded with her image at MGM Grand, which is owned by the same company as Mandalay Bay. She plugged the machines on her show on Sept. 20 this year, less than two weeks before the Oct. 1 mass shooting in which 58 people were killed and more than 500 injured.